June is about to draw to close and I’ve spent the entire month within the borders of the UK. That’s quite a change from the previous month: I was at three different conferences in three different countries in May. First off, there was Mobilism in Amsterdam. It was, unsurprisingly, very good indeed. Mind you, I was getting a little disheartened on the first day of the conference when there was talk after talk describing how to make web apps look and feel more like native apps. The question of why exactly this would be desirable never seemed to get asked. I was beginning to worry that we were going to enter a period of making the same mistakes we did a few years back when everyone was trying to slavishly imitate desktop interactions on the web. The result is a kind of uncanny valley of interaction where apps behave almost, but not quite, like their native counterparts. My fears were allayed on the second day of Mobilism though, particularly when Scott blew everyone’s minds. 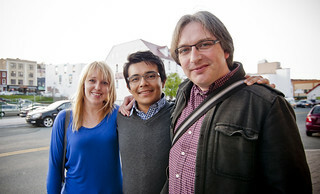 There was a veritable feast of future friendly thinking from Lyza, Jason, Brad, and Stephen too. Speaking of future friendliness, there was a second Mobilewood gathering recently and the Future Friendly site now sports a new section entitled Come Aboard. 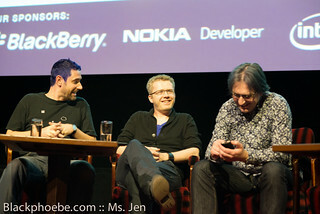 By the way, thank you to everyone who provided questions for my panels at Mobilism. They went well, although in retrospect two panels were maybe a bit much. Still, it was fun trying to get a statement other than “no comment” out of the Google Chrome representative on the browser panel. Later in May I was in Belgium for Multi-Mania, a grassroots event run by students. I enjoyed myself but there was definitely a problem with having multiple tracks—the usual feeling of missing out on something, especially when some of the rooms filled up really quickly. The main stage also suffered from being directly connected to the exhibition hall which meant there was a lot of sound leakage. A shame, really. My last speaking gig in May, on the hand, was a very smoothly-run event. I was in St. John’s, Newfoundland for Go Beyond Pixels. The fact that the conference was really well put together is all the more surprising considering it was the first time that Levin had ever organised an event! I hope it won’t be the last. He put on a great show and gave all the speakers a very warm welcome. Oh, and Newfoundland was beautiful. Since getting back, I’ve been enduring the English Summer. As nice as Brighton has been for a month, I’m looking forward to getting to sunnier climes. So that’s exactly what I’m going to do, starting with a trip to Barcelona in just over a week’s time for Webvisions. I’ll be doing a half-day workshop on responsive design and progressive enhancement. If you’re thinking of coming, here’s a little tip: go to the registration page, scroll down to the bit where it says “enter promotional code”, click that link, type “KEITH”, and hit the “Apply” button …Boom! Now your conference and workshop pass has a 20% discount applied. Alas, I won’t be able to stick around for the conference day itself. I need to get over to Austin for An Event Apart. I’m very excited to get to Austin when it’s not South by Southwest, but I’m also extremely nervous about my talk. I’ve spent most of this month at home trying to finish up my presentation. I fear I may be trying to squeeze an awful lot of stuff into one talk. I might have to speak very fast to fit it all in …or I suppose I could be sensible and try to trim the presentation down. Anyway, there are still some tickets available for AEA Austin if you want to see me sweat …and I’m not just talking about the Texas heat.